Particle and Nuclear Physics (PNP) is a hot area of science research at IST physics department. Research and PhD programs/projects are done in collaboration with prominent international institutes, such as: CERN, the Pierre Auger Observatory, Jefferson Lab, important universities of the peninsula, Valencia/Barcelona/Madrid, and other big universities of Europe/USA/Japan/India. Researchers/professors working in PNP also include many people from other nationalities. All researchers belong to one of the Research Units, centers and labs receiving funding support, for e.g. PhD grants, from FCT - Ministry of Science and the EU. The scientific works are published in international renown journals, such as: Physics Letters, Physical Review, JHEP etc. Students are encouraged to do their post-graduate studies in Particle and Nuclear Physics either at the level of a Master of Science (2nd Bologna cycle), or a Ph.D. (3rd Bolongna cycle). The usual way to initiate a study is to make first contact (please feel free!!) directly with one of our reseachers/professors. E.g. the Master's degree (2nd Bologna cycle) MEFT program provides, as an example, some concrete thesis themes in this area, along with diverse grants. Additional info also at the IST site. Area Coordinator: Professor Mário Pimenta (pimenta@lip.pt). 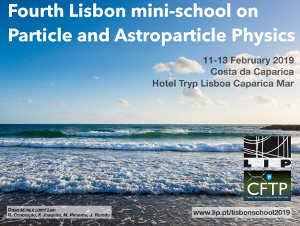 The Lisbon mini-school on Particle and Astroparticle Physics provides under-graduated students with a comprehensive introduction to the field, covering both theoretical and experimental aspects. This school will give insigth to recent discoveries and to open challenges and will stress the research opportunities in the field in Portugal. The school is mainly aimed to third year under-graduated students who have completed the course in Quantum Mechanics I.